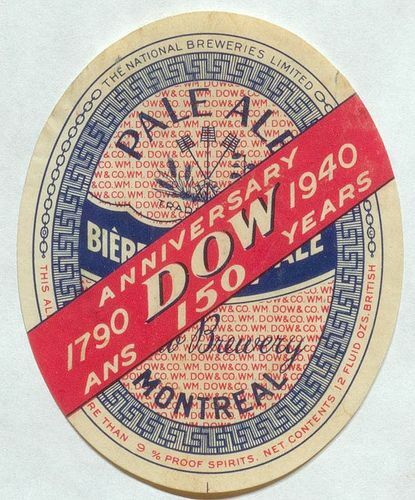 Dow Ale was a legend in Quebec brewing until a strange event in the late 1960s spelled the end of the brand as a force. Quebec City, the old capital of the Province of Quebec, was a stronghold of the Dow brand. William Dow had started brewing in the 1800s in the Province. By the 1960s and after various mergers and takeovers, Dow, formerly named National Breweries, had four main brands: Dow Ale, Kingsbeer (a lager), Champlain Porter, and Dow Porter. Dow Ale was the big seller. In 1966, hospitals in Quebec City started to notice that a spate of men in their 40s-60s, known to be heavy beer drinkers, were suffering from cardiomyopathy. It’s an ailment often manifested by irregularity of heart rhythm. Many died, something like 20-25 persons. Not all these men consumed the Dow brand but most did. Dow in Quebec City – it had a brewery there and in Montreal – made the fateful decision to dump its inventory of Dow Ale, a good faith gesture meant to reassure people. However, the population viewed the action as an admission of culpability. The beer forever became known as “la bière qui tue“, or the beer which kills. Medical studies conducted by Quebec authorities never established a direct link between Dow’s beer and the deaths. Nevertheless, many experts felt that cobalt sulphate, then used in some brewing to improve head or foam retention, probably caused or exacerbated the medical issue. To be sure, these men were heavy drinkers, they consumed a dozen beers each day or more. Also, the malady seemed to be concentrated in Quebec City, yet Montreal was a large market too for the brand. But while many breweries in Quebec added cobalt sulphate to their beer at the time, Dow apparently used an unusually large amount, some accounts state ten times the normal quantity. Hence the feeling on the part of many doctors that cobalt was probably responsible, but it was never conclusively proved. Still, Dow stopped using the chemical after the debâcle and the deaths did not recur, at least not in the concentrations that had been noticed. Needless to say Dow beer fell sharply in sales after the disaster. In 1972 the brand was sold to another brewery, Molson Breweries in Montreal, which continued to brew the beer until the early 1990s. In 1987 Molson merged with Carling O’Keefe, the final successor to National Breweries (itself a combination of 14 breweries formed after WW I of which Dow was a key component). Online there are numerous examinations of this unique incident in both Canadian and international brewing history. Here is a good place to start, for those interested in more information. In recent posts, I was discussing the great Quebec and Canadian culinary authority Jehane Benoit, and it turns out she had a connection to Dow. Benoit had studied food science in Paris in the 1920s under a master nutrition expert, Edouard de Pomiane. I was discussing beer cuisine in various francophone areas in the world, and noted that Quebec cuisine appeared to have only a few recipes using beer. But Dow Brewery was a client of Mme Benoit in the 1950s, she did promotions for them and this led to a book of recipes called, in English, Cooking With Dow. While the origin of the recipes in the book is diverse and some were probably invented by Mme Benoit, this book must be considered to enlarge the number of Quebec dishes which employ beer in cooking. It is not, therefore, just in the last 20 years or so that books have appeared in Quebec proposing a beer-based gastronomy. The creative and enterprising Mme Benoit was doing it in the 1950s. In a later post, I will discuss some interesting recipes proposed by this great food authority. Note re image: The image above was sourced from the Thomas Fisher Library beer label collection at University of Toronto via Flickr, here. All intellectual property therein belongs solely to the lawful owner, as applicable. Image used for educational and historical purposes. All feedback welcomed. Many years ago I used to drink Dow Ale and to this day I still say :wouldn’t a Dow go good now ‘. I am over 70 . Thanks Jim, good to hear. Do you recall anything about the taste perhaps? Just in your own words, how would you separate it off from the other names then current? I have a wonderful old Dow Beer Electric sign Model # 2040. The sign reads “Dow Plaisir Garanti” . Where might I find a buyer for this? Does the sign still work? Is it in original or good condition? Lastly do you have a picture you can email to me? Keep in mind, that back then in Quebec, a dozen beers were quarts, not pints. Quarts 22 oz, pints 12 oz in Quebec then. Sounds like in Quebec city tavernes the practice was to order the quart…? yup.. I grew up there with the ‘men only’ taverns, and it was very common to see tables covered with quart bottles.. seems it was the size of choice. They do state, in part, what heavy meant because they recite the level the sick patients were habitually drinking, a minimum of a dozen drinks a day or so which is way too much. Whether they would consider half that, 6 drinks a day, heavy, I don’t know, I would certainly. I don’t think it’s really changed and the martini lunch thing was always exaggerated anyway. I starting working in about 1975 and drinking at lunch was very rare, it was only done at Christmas, or for isolated entertainment of clients. In England then maybe people did drink more than today, the culture was different, but even then I have my doubts. You may have received comments on this already but Quebec City is still the capital of Quebec. As well The French expression “plus ça change plus ça reste pareil”. Means the same thing but it flows better. Definitely remember Dow but was too young to drink it. But what was socially acceptable then? One reads of “martini lunches”, etc. I’m not suggesting that, physically, there would have been less or more of a detrimental effect. I remember a friend of my wife’s, he was English, telling me thirty years ago that in (business) London two pints was acceptable with lunch. If you ordered a third it was bad form and people would talk. What interests me is that this study you referenced states “heavy” without defining the term, and I’d love to know what they meant! I’d say so as well. I wondered if “heavy” then was heavier than “heavy” is now. It’s hard to say, you would have to look back to see what experts advised as the maximum safe units per week people should drink. In general, I don’t think it’s really changed much, but that’s an impression. I wonder what a “heavy drinker” was back then, considering the time and what was acceptable, socially. Far (far) more than today I’m guessing. I’d be interested if you could speak to this further. Do you recall sampling it yourself? If so, how did it taste? Was it popular due to quality or excellent advertising? Alan, thanks. I do remember it clearly in the 70’s, people knew of course the story of the decline of the brand and some wouldn’t touch it, but I did buy it occasionally. In this period it was very ordinary. However, the 1970s was a time when most well-known brands had declined in taste and bitterness. I am sure in the 1950s and earlier it was good and distinctive.